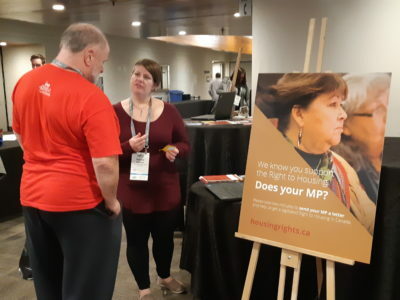 Highlights from Day One of Three of #CAEH18 in Hamilton from Nov. 5-7. From federal funding announcements to the connections we make over our shared goal to end homelessness. We kicked off our conference recognizing that homelessness today is a result of colonization, and Elder Yvonne Maracle spoke about how important it is to bring people to the solutions table with lived experience. If we want to solve homelessness we need to include people who are homeless, she says. If we want to solve Indigenous homelessness, we need make space for Indigenous people who have or are experiencing homelessness. Tim shared how the 20,000 Homes Campaign has surpassed 18,000 people housed in its 38 participating communities across Canada. And how those communities are on track to reach our goal of 20,000 people by March 31 (well ahead of our original target July 1, 2020!). Fourteen communities will have quality real-time data, 10 communities will have or be in the process of implementing coordinated access systems, 5 will be reducing chronic homelessness and 1 community will achieve functional zero on chronic homelessness. At our lunch ceremony we were honoured to help present the Local Indigenous in Eliminating Homelessness Awards to Janice Lewis-Deeley, Melanie McAulay and the late Adeline Lewis. All three women were presented with a decorated eagle feather, decorated eagle feather box and an engraved plaque for their dedication to ending homelessness in their communities. These three incredible people were met with a well-deserved standing ovation. Adam Vaughan, parliamentary secretary to the Minister of Families, Children and Social Development, led a panel looking ahead to Reaching Home. Amanda DiFalco, City of Hamilton, Iain DeJong, OrgCode, and Susan McGee, Edmonton Homeward Trust, spoke about how successful communities will be the foundation for others to follow suit to reduce chronic homelessness within their borders. These were just some of the folks featured, but our sold-out conference had 1,300 participants from all over Canada and the world come together to begin the end of homelessness. The really exciting connections are happening in the hallways between the sessions. Researchers, policymakers, front line workers and people with lived experience sharing, connecting and finding the inspiration to continue toward our conference’s goal of ending homelessness. 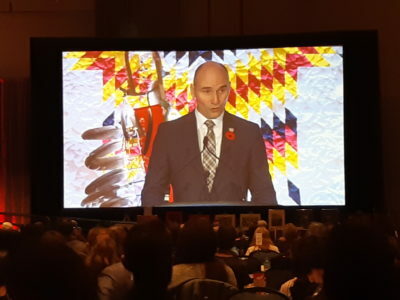 Check out our videos on Facebook from the keynotes and presentations we live streamed throughout the day including Minister Jean-Yves Duclos, the local Indigenous awards presentation, and the panel with parliamentary secretary Adam Vaughan. We’ll be live streaming more keynote speakers and candid interviews with participants and delegates on Facebook for Day Two! We can’t wait to see what happens on day two. 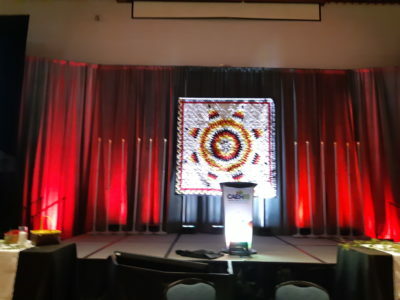 Remember to use #CAEH18 on Twitter and Instagram too.